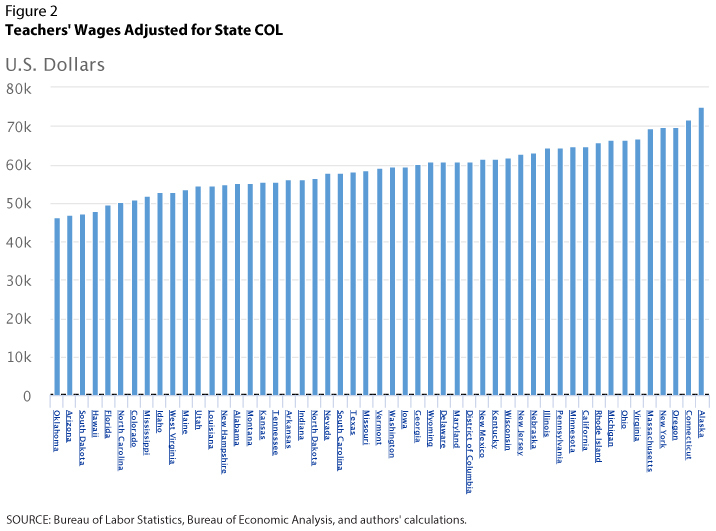 Strikes by teachers in West Virginia, Oklahoma, Kentucky, Arizona, and Colorado have highlighted differences in teachers' wages across the country.1 Teachers in these states have lower-than-average annual wages but also lower-than-average cost of living (COL). Adjusting for differences in COL narrows the differences in teachers' wages across the country, but substantial differences remain. Wages that are adjusted for price-level differences are called "real wages" because they measure the real purchasing power of wages. 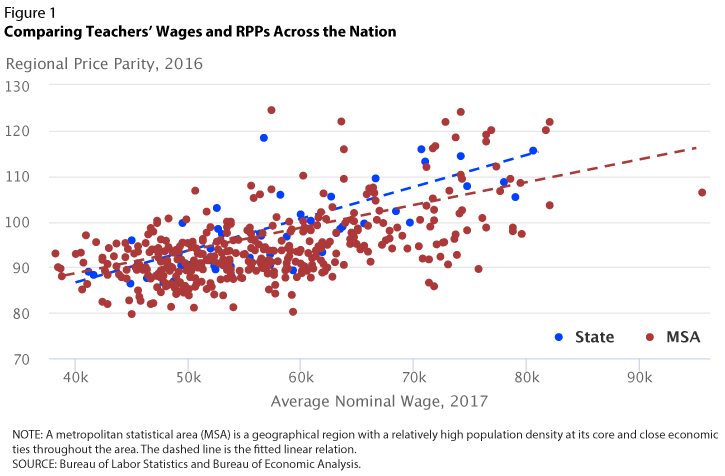 Figure 1 shows the relationship between average teachers' wages in 2017 and COL in 2016 measured by regional price parities (RPPs). An RPP of 100 indicates a COL equal to the national average, while an RPP of 110 indicates a COL 10 percent above the national average. States where teachers earn higher wages also happen to be the states with higher COL. Teachers in New York earn the highest nominal wage at $80,625 per year, almost twice as much as teachers in Oklahoma, who make the lowest nominal wage at $41,145 per year.2 However, COL in New York is 15 percent above the national average, while COL in Oklahoma is 10 percent below the national average. Figure 2 adjusts wages for regional differences in COL. As expected, interstate wage gaps shrink after adjusting for COL, but the differences in wages fail to completely capture the differences in COL. The gap between New York and Oklahoma still exists but significantly shrinks from $40,000 to $28,000 in real (COL-adjusted) dollars.